The final spot in the men's Money in the Bank ladder match, along with another women's spot, will be decided on next week's SmackDown. 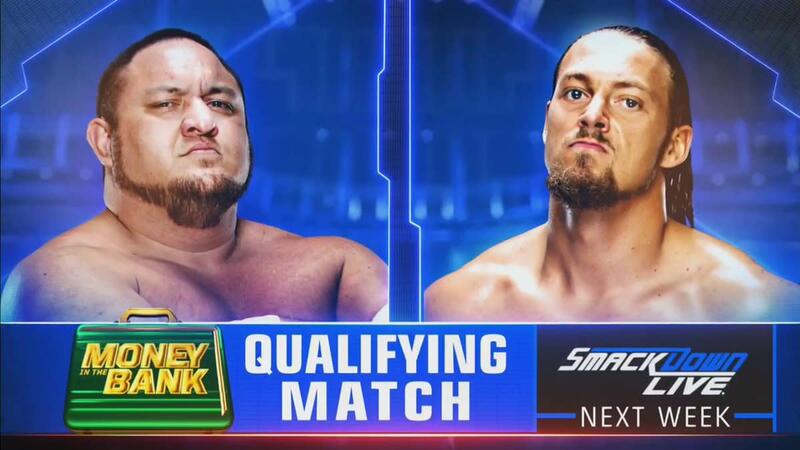 Samoa Joe will compete for the first time on SmackDown since the Superstar Shakeup as he will battle Big Cass in a qualifying match to fill the last spot in the men's match. Joe hasn’t been seen since Backlash when he lost to Roman Reigns. Cass was attacked tonight by Daniel Bryan after harassing him repeatedly. Since Bryan targeted Cass' leg, that may be a factor heading into the match. Meanwhile, Lana is set to face Billie Kay in another qualifying match. Kay’s IIconics partner Peyton Royce had an opportunity to compete in a qualifying match last week, but was defeated by Charlotte Flair. This would also mark Lana’s first match on SmackDown since October, when she teamed up with Tamina and Natalya in a losing effort against Becky Lynch, Charlotte and Naomi.